I’m embarking on a new novel and my writer’s antenna is now up to any mention of a best-selling novel. I can hear you asking: What is best-selling language? 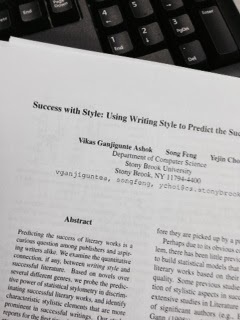 A Grammar Girl post last week mentioned a published study that used an algorithm to study styles used to produce commercial success. The results produced suggestions of words that might produce more success than others. Researchers culled the books…and words…from the Project Gutenberg to study the style of these publishing winners. The report suggests words or parts of speech from successful works, but it doesn’t tell me how to put them together to reach my audience. That’s up to me. That's for me to figure out and put word after word after word to convey something to my readers that connects with them. So, if the next time you sit at your desk ready to write, are you looking for an external list of words to plug in? Or are you choosing the words that come from within you? Are you selecting words that resonate from your own years of experience? Or even from your character taking over the plot and fighting with her nemesis? Sure, writers study books on craft and workshop their writing. But using an algorithm to determine a best seller seems far removed from my heart that I pour out on the page, day after day. The study is interesting, but I’m going to let my characters tell their own story in their own words. best seller or not. Elizabeth King Humphrey is a writer and editor living in North Carolina. Her writing credits include the Idiot’s Guide: Gluten-Free Eating (Alpha, 2014). Elizabeth--I think if the characters ring true, if we can connect with them and mourn with them and cheer them on and if it's a story that keeps up turning the page--if all that happens, we can forgive the absence of small things that people claim are necessary for a book to become a best-selling novel. I think if you channel too much effort into trying to make your book fit some algorithm for success, you're going to sacrifice whatever charms it would have had if you had let it develop on its own. We're people, not machines; we simply don't work that way. And since they have yet to develop a machine that can write a best-selling novel, there must be something to this humanity thing after all. This is NOT like the chicken and the egg. I think in this case the bestselling novels came first and then someone created this algorithm afterwards. I think that if you tried to write to this algorithm, you might go mad!